We’d love your help. Let us know what’s wrong with this preview of Swinging At Love by Kendra C. Highley. Ballerina Alyssa Kaplan has a problem, too. The shiny new sp Outfielder Tristan Murrell has a problem. As the number two slugger for the Suttonville Sentinels, his team is counting on him to make their very first run at the state championship. But he has a secret—his swing has totally deserted him. As in, he can’t hit anything. He needs to fix the issue, and fast, but how? To ask other readers questions about Swinging At Love, please sign up. This was a YA contemporary romance featuring a dancer and a baseball player. Alyssa was an okay character, and I liked how much faith she had in her father and his business. I also liked how she tried to help people at the batting cages, even when there was nothing in it for her. The storyline in this was about Alyssa’s father possibly losing his business – a sports facility with batting cages, and about Alyssa trying to help find a way to save it. We also got a romance storyline between Alyssa and a baseball player called Tristan who was having problems with his swing. The romance in this was quite sweet, and I liked how Alyssa was happy to make the first move. What I didn’t like was the lying though. When Tristan and Alyssa found out that their respective best friends had feelings for Alyssa and Tristan they should have just been honest and admitted that they already had a relationship together, rather than lying and putting each other in a difficult position. Plus, lying to your best friend is never going to end well. The ending to this was okay, and I was glad that everything worked out okay in the end. I just wished that there wasn’t lying involved! Tristan was having a problem on his swings and doesn't know how to bring his game up in preparation for the state championships. Then he meets Alyssa at Swing Away, who notices his problem on swinging and coaches him to Thank you Entangled Teen for providing an ARC via NetGalley in exchange for an honest review. Tristan was having a problem on his swings and doesn't know how to bring his game up in preparation for the state championships. Then he meets Alyssa at Swing Away, who notices his problem on swinging and coaches him to do it properly. Alyssa is a former softball player and ballerina. Her family owned Swing Away, a batting cage business for years. Due to the lack of funds for maintenance and repairs, it's on the verge to close down but she's not giving up even if it means giving her dancing camp money just to save their family business. Alyssa's family is in danger of losing their business. Tristan is in danger of keeping his team from the championship due to his batting slump. In an effort to secretly work on his swing, Tristen finds himself at Alyssa's batting cages. Circumstances brought them into each other's lives, and they found comfort in each other. But there may be some unexpected hurdles to overcome before this romance is able to fully blossom. I really liked both Alyssa and Tristan, and I had not problem getting on this ship. Alyssa was this softball player turned ballerina, who she still knew her way around the ball field. She was spunky and not afraid to go after things she wanted. I admired her dedication to her friends and her family. She was loyal and quite often put other people's needs above her own. This was something she struggled with in the story, and where she experienced the most growth. Tristian was a star ballplayer, but he was not your typical jock. He was so sweet to Alyssa. I swooned many times. He was also a loyal friend and teammate, and I really liked the bromance between him, Dylan, and Kyle. They actually talked about their feelings, and supported each other. It was great. Highley did a great job weaving baseball into this story. She did a great job with the tension experience with Tristan's failing swing and each big game they played. I have read some reviews where they felt the ending was over the top, but I loved it! Highley showed Tristan as a hero in multiple ways, and the ending was the big gesture. It was perfect. I found this book adorable and a total feel-good read. There was a great romance, supportive families and friends, and a lot of swoony-sweet moments as well. Tristan is a baseball player. He's a slugger for the Suttonville Sentinels and there's a big chance he'll be team captain after the summer. Tristan has a problem though, he's lost his swing and needs to find a way out of his slump before he ruins his team's chances to win the state championship. He decides to do some training on his own and ends up at Swing Away, an old fashioned batting cage business. There he meets the girl of his dreams, will she be able to help him get his swing back? Alyssa Tristan is a baseball player. He's a slugger for the Suttonville Sentinels and there's a big chance he'll be team captain after the summer. Tristan has a problem though, he's lost his swing and needs to find a way out of his slump before he ruins his team's chances to win the state championship. He decides to do some training on his own and ends up at Swing Away, an old fashioned batting cage business. There he meets the girl of his dreams, will she be able to help him get his swing back? Alyssa likes working at her father's batting cages very much. She has two loves, baseball and dancing. She wants to be a professional ballet dancer and is working hard for an important audition that will, if she succeeds, give her the chance to dance all summer. She's been saving for it for a long time, but her father's business is in trouble and Alyssa wants to help him. She can't stand the idea of working for a shiny over the top sports complex that's putting small individual businesses at risk. What can she do to save her family's livelihood? And does falling in love fit into her busy schedule, is there room for a gorgeous baseball player, someone who makes her heart beat faster every time she sees him? Swinging at Love is an incredibly sweet story. I immediately liked Alyssa. She's mature for her age, she works hard, she never gives up and she's smart. I loved how talented she is. Tristan is a good guy, he's a gentle kindhearted person with many insecurities because he wants to do well and make his family proud. He's a great listener and he knows what he wants. Alyssa helps him to get over his slump and they fall in love. There are a lot of things working against them though and I couldn't wait to find out if they'd have a chance together. Copy received through NetGalley in exchange of a fair review. This was a really cute, fast read. I liked the story, and the characters were great but everything seemed even more rushed than the first book. I wish it was a little slower, I wish there was more build-up to the romance, the way it did in book one of the series. (I have somehow stopped being a fast-pace novel fan, I don't know how and when that happened). I loved Alyssa and Tristan. She's smart and stands up for herself and it was so much fun watching her put baseball boys in their place. I loved that some of them took her for a stupid girl and she showed them up at baseball. Tristan is sweet and loyal and knows when to back off and not always save the day. The two of them were absolutely delightful. Yes, there we I had read the first book in this series and was excited to get the invite to read this one. And it was exactly what I wanted to read. Yes, there were some miscommunications that drove me mad, but again, I was so wrapped up in what was happening, it was easy to overlook. I loved the ending and the epilogue and of course the fact that Faith and Kyle were in the story. I can't wait to see who is next. If you’re into baseball and YA romance, you’ll probably love this, but if you’re like me and don’t understand much about the game, you might find yourself a little lost at times. This is my third book by this author, and second book in this series. I really, really enjoyed The Bad Boy Bargain, but it had a lot less baseball than this one. I don’t really blame the story here for my lack of connection, because I bet the problem is my total lack of knowledge of everything baseball. Like hockey, this is just one sport that, no matter how many games I try to watch, I end up never quite understanding. And if there’s something Swinging at Love is heavy on is baseball. Alyssa and Tristan are fans of the game—her family owns a batting cage business and he’s one of the school team’s stars, so they live and breathe baseball. That translates well into the story, which features many scenes with the guys practicing and playing, and the girls talking about the game. Even Faith and Kyle, the main characters from the first book, are all about it when they make an appearance. Thankfully, Alyssa gets to do more than just talk about it, though. She practices with Tristan and uses her knowledge (and her kisses) to help him get over his batting slump. That was one of my favorite sport-related themes in this story. I liked seeing Alyssa in action and I appreciate how the author showed her as someone who could’ve gone down the athlete role if she’d wanted to. Like Faith, though, Alyssa was more into music and dancing. Tristan also ended up having a real important role in Alyssa’s life. He helped save her family struggling business, showing me that those two were really good for each other. I liked how it felt as if they came into each other’s lives at the right moment. That made the romance even more special. Tristan and Alyssa were really cute together, but they lacked the kind of chemistry I’d come to expect in books by this author. Maybe that’s because everything came a little bit too easy in their relationship. First, it took them too long to even share scenes—by chapter eight, they’d interacted once or twice. But once they did start interacting, they were already kissing and moving into a relationship. The obstacles that came were overcome to easily and never created the amount of tension I normally want in my romances. I think part of the reason the story lacked tension is because both Alyssa and Tristan were mature for their age. They handled every situation the best way possible, and, even when they didn’t, they faced the consequences and didn’t back down. That made them “good people”, as Alyssa and Tristan said themselves, but also made the story a little boring. Just like with the Bad Boy Bargain, this book is chock full of cuteness. That is the best way to describe it. It is like a smile in a box. I really liked Tristan and Alyssa. I still think Faith and Kyle were my favorite couple but I adored them so much that it is hard to come close. But Tristan and Alyssa did come close, and if it were for some lying and some miscommunication that irked me, they might have passed Kyle. But they are a close second and I can't wait to see what the next story in the series is going to be about. I really enjoyed Tristan and Alyssa's story. It has all the signature cuteness I have come to associate with Kendra's books. It is my favorite thing about them. Tristan is a star on the baseball team but he has lost his swing. And Alyssa's family business is in trouble. Each of them are doing their best to save their respective thing and their paths cross and cris cross in the most adorable ways. If they only could have been a bit more honest with each other and with their friends I think this book would have been perfect. But live and learn. They are still young. I really liked their story. 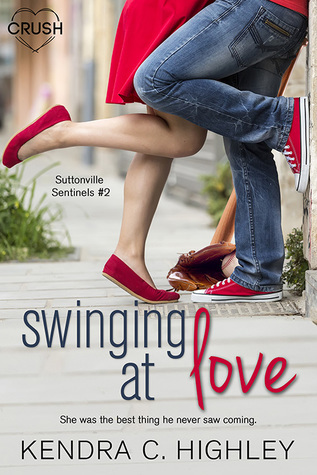 Bottom line: if you are looking for a quick young adult romance that is super cute and has characters you will love (who are not at all annoying) check out Swinging at Love and the Suttonville Sentinels series. I loved the mature, yet still age appropriate, characters featured in this extra cute romance. Kendra C. Highley continues to astound me with her romances. I loved The Bad Boy Bargain, so much so that I admitted that Kyle Sawyer gave Ben Franklin a run for his money. If you know how much I loved Ben, you know that is a big deal. Well, add Tristan Murrell to the list of male leads that I am swooning over! Okay, it’s hard to compete with Kyle and Ben—they’re at a whole other ballpark of book boyfriends. So, Tristan had a lot to measure up to, and I couldn’t wait to meet him and fall in love with him like I had the other guys in my heart. This is the second book in the Suttonville Sentinels series, so I got to see some of my favorite characters from The Bad Boy Bargain in a whole new light. Kyle Sawyer was still as cute as ever, and I honestly don’t know how he convinced anyone that he was a bad boy before. Faith Gladwell locked on tight to the friend I wish I had role, and I even fell for a few new characters. But the focus of this story: Alyssa Kaplan and Tristan Murrell, and I shipped them so hard. Alyssa was an ex-softball player turned dancer and daughter of the inside batting cage owner in Suttonville. She knew how to throw a wicked curve ball and danced in pointe better than almost anyone at the studio. She was fierce and independent. While she obviously had a girly side, she wasn’t afraid to work on the pitching machine in cage five or smack talk an overly cocky baseball player when he needed to be put in his place. In other words, I loved half of the story being told through her eyes. She was loyal to a fault, and she had to learn that sometimes she did need to put herself first. Her first decision: fall for Tristan. Their happiness came to a resounding halt when a few secrets are thrown into the mix. I live tweeted while I read it and had so many emotions going through my head. It was obvious that Tristan and Alyssa needed to be together, but it stressed me out waiting for it to happen—in the best possible way, obviously. For instance, I didn’t know what to think of Alyssa’s best friend, Lauren. Sometimes, I hated her. Other times, I was like, “Go Lauren!” It’s a rollercoaster of emotions the whole way through, and I could scantly put it down. I basically read the whole thing in one sitting and went from one emotional spectrum to the next. Let me just talk about Tristan’s best friend, Dylan Dennings. PLEASE tell me he’s getting his own book? I’m just going to leave that little seed of I need that book right here. Kendra! Stop with the amazing books! Okay, okay, don’t stop with the amazing books because I want to keep reading them forever. I’m a romance junkie, and Kendra C. Highley is at the top of my list for insta-buy, must-read, and I-need-that-book-now authors! I’m already anticipating her next book. Lovers of baseball, ballet, and a few stolen kisses here and there can rejoice for this story of finding the swing of things, love and otherwise. I know basically nothing about baseball. I mean I know the basics, but I have never actually watched an entire game nor do I know anything about the intricacies when it comes to balling.. I know cricket quite well and I know all about loving a sport, being caught up in it, breathing and living the sport. And that's what Highley did a brilliant jo Super cute book! And that's what Highley did a brilliant job at describing. While I might not quite get all the sporty jargon when it comes to baseball, I felt what it meant. I could relate to the two MCs love for it, the feeling of the players in a game. Which is my favorite part about the book. I get why people love baseball, Tristan's worries and problems. Same for Alyssa. Highley shines in descriptions of feelings and situations. Beautifully written. The character building is really well done for the MC's. Same goes for the close friends. However not all of the support cast feels rounded and finished. I am not that impressed with the meanie for example and even the parents felt at times a bit unfinished. There was a fair amount of angst, which I actually really loved. And Highley hinted a few issues, that were actually quite interesting. But I felt all of it was resolved really fast, which kinda seemed to take away from the seriousness of the issues. The end is swoony and perfect and left me totally smiling. The perfect end to a enjoyable cute & fluffy. A must read for lovers of the genre. I can't wait for the next installment!! Kendra C Highley has hit another one out of the park! I fell in love with Kendra's writing when I read Finding Perfect in August of 2015, and every book since then has been just as great. I can honestly say that she's one of my fave contemporary YA romance authors, and I'm always going to read what she has coming out next. Late last year I fell in LOVE with Faith and Kyle Sawyer in the first book in the Suttonville Sentinels series, and Alyssa and Tristan Murrell (and the glimpses of Faith and K Kendra C Highley has hit another one out of the park! I fell in love with Kendra's writing when I read Finding Perfect in August of 2015, and every book since then has been just as great. I can honestly say that she's one of my fave contemporary YA romance authors, and I'm always going to read what she has coming out next. Late last year I fell in LOVE with Faith and Kyle Sawyer in the first book in the Suttonville Sentinels series, and Alyssa and Tristan Murrell (and the glimpses of Faith and Kyle) have made this second book in the series even swoonier if that's possible. Look for the fundraising scene people, you're going to love it! Oh and the scene where Faith and Kyle are practising a contemporary dance routine is maybe the best thing ever. Alyssa is not your typical teen girl and I loved that about her! She's a former softball player turned ballerina who works at her parents' failing sports facility. Determined to keep the business up and running, she does all she can to help- something not every teenage girl would do, and I found that to be so admirable! I loved the relationship she had with her parents. Tristan is one of the stars of their high school baseball team and he's going through a slump. With parents that don't really take an interest in his sports career and his brother away at college he doesn't really have anyone to talk about what he's going through. Not wanting anyone, especially his teammates, to get wind of his troubles he ends up at Swing Away, where he runs into Alyssa. Not one to shy away from offering up advice, welcome or not, Alyssa gives Tristan a few pointers after seeing him swing and miss more often than he was connecting. Even as he shrugs off her advice, in typical boy fashion might I add, there's a little spark of attraction between them that's further fueled the more time they spend together. It wasn't every day that a hot guy stared at her like he'd just come in from the desert and she was an oasis. Alyssa and Tristan are such darling characters. I loved that they weren't afraid to share their feelings with each other, even with, maybe especially because of, how quickly things happened between them. They both come from such solid foundations, even if their upbringings were quite different. Alyssa is a calming and centering influence on Tristan and he was everything she didn't know she needed. You'll find some of the usual high school drama infiltrating the pages of Swinging At Love. Even the best of friends don't always get along, and at one point or another someone's feelings are going to get hurt, albiet unintentionally. Alyssa and her best friend, and Tristan and his best friend, find themselves in a bit of a love quadrangle, which leads to a bit of a conundrum between friends. But it's high school and these things tend to work themselves out in time. I liked how things weren't glossed over and everyone was able to have their say, especially Alyssa- I wanted to stand up and cheer for her! The ending to this book was particular sweet and had me swooning hard for Tristan. He's everything you'd want if you were a 17 year old girl! Here's hoping we'll be seeing books for the best friends in the near future! Alyssa's family owns and runs Swing Away, a small local business with eight run down batting cages, which is being squeezed out by a new multi-sport arena called Top Sports which has batting cages, a bar, bowling lanes etc. She and her best friend Laur Tristan is one of his school's best baseball batsmen but he's having a slump. For some reason he has lost his mojo and nothing he can do makes it better. His best friend Dylan is the pitcher and keeps giving him pep talks but nothing seems to help. Alyssa's family owns and runs Swing Away, a small local business with eight run down batting cages, which is being squeezed out by a new multi-sport arena called Top Sports which has batting cages, a bar, bowling lanes etc. She and her best friend Lauren are trying out Dallas Ballet Conservatory and practicing every moment they get at Madame Schuler's with their other friend Faith (the lead in The Bad Boy Bargain). Tristan decides to work on his swing in peace and chooses to avoid Top Sports where the rest of the team hang out, instead going to Swing Away where he meets Alyssa who gives him some pointers about his game. Alyssa and Tristan are instantly attracted to each other but unbeknownst to them Dylan is also attracted to Alyssa and Lauren is attracted to Tristan - cue a quartet of confusion! This was a really cute, fun romance featuring baseball. I know nothing about baseball, so lots of it went over my head, but it seemed quite detailed. Tristan and Alyssa are all round great characters, hard working, respectful, loyal and family-orientated. I also thought the love quadrangle was well-handled and had a slight twist. Thoroughly recommended, be aware this is a teen imprint so Alyssa and Tristan are 17-ish, the romance is PG but very sweet and you don't need to know much about baseball to enjoy. I was highly anticipating this book because I loved the first one. Faith and Kyle where adorable and I was looking forward to reading more by this author. Let me tell you she did not disappoint. Alyssa and Tristan warmed my heart so much. Their romance is so believable and age appropriate. I loved how they both complemented each other. Alyssa has a lot going one. Her family business is going broke and she can't do anything about it. Tristan has lost his swing and needs to get better before the season is over to take over the team next year. I love how the romance did not take away from a lot of the stuff that was going on at home. I LOVE THE PARENTS IN THIS SERIES! They are so supportive and love their children so much and I really appreciated that. Also if you read the first book and loved Faith and Kyle, I am glad to tell you they appear in this book and you will get all the feels. Overall, If you are looking for a sweet cute romance to make your day, do your self a favor and pick this series up! OK, this was a solid next book in the series that I didn't know was going to be a series!! And while I'm a little disappointed Faith and Kyle's BFFs weren't the focus of this story, Tristan and Alyssa were a pretty freaking spectacular consolation prize. ;) And no, you don't have to read book 1, but honestly, why wouldn't you? Shoot, I'm not even a baseball fan, or really a big muscular arms on a guy girl, but DAMN. Ms. Highley knows how to make me swoon. This is exactly what I love from a young adult romance...a fun quick read, lots of lightness and sweetness and swooning, but with just enough depth to give me more. I think the thing I love most about both this book and the previous one is the sweetness of the heroes. Tristan was just adorable! He didn't have the same background that Kyle did, but he was just really down to earth, and he knew what attracted him. He had his own struggles coming from a family with completely different interests to him, and I could really appreciate that aspect to his story. I liked that while he did feel like the odd man out in his family, his family was still good peeps...just lost in the world of baseball. It's an interesting facet that I don't necessarily read a lot, where you have that dichotomy, but still have the love you know? Not that that makes it any easier. It was nice that he had Keller too. And Alyssa was just awesomesauce. I loved her sass, her insecurities, her straight talking, her confidence in certain things. If I swung that way, I would totally be intrigued by her. And I loved her own family dynamic. I loved how close she was, how much her family influenced her, and it was nice to see a story where it wasn't rich guy with poor girl (or vice versa), but there was a money/lifestyle disparity. But it wasn't really the focus. It was about how her family was struggling with their local business in an economy that's hurting everyone. I loved how important Swing Away was to her, and what she was willing to sacrifice for it. And oh wow, Tristan and Alyssa's chemistry was fantastic. Right from their first interaction, you could just feel it. I enjoyed that. I was SERIOUSLY concerned with the way things would play out with Dylan and Lauren, and I was kind of disappointed in how it went initially, but it didn't drag on like I thought it would, and it resolved better than I expected. So phew. For Tristan the stress equated to his swing going away. He feels his parents placate him and don’t really see him. He is trying to be all he can be but he is lost. When he meets Alyssa at the batting cages things change. He sees a sweet fun honest girl. Not one to placate him but one who is herself. She helps him smile and relax. Makes him see beyond the forest and to the trees. The attraction between them is precious. Alyssa is stressed by the financial situation of her dad’s business and getting into the ballet camp over the summer. So meeting a nice guy like Tristan who helped her heart soar and feel free helps her dancing. She also felt she could be herself around him. They both get close to each other and learn about one another before they even go out on a date. Oh dear, here we go again. As if Kyle and Faith were not enough in the first book the second one comes out. I actually had no idea this was going to be a series. I remember reading about Tristan in the first book and oh wow if I thought I loved him in the first book, this one is entirely on a different level. Alyssa, a ballerina who loves to dance is practicing for the summer camp audition with Lauren (do you remember these two? It actually took me a while to notice that I read the first book and loved it! This series reminds me of The Fine Art of Pretending, loved that book too). Alyssa is caring, confident and knows a lot about baseball and pitching. I guess she would since she used to be a pitcher for the softball team but she leaves it as she loves dancing more. Enters Tristan, who is also really sweet and faces a big problem as he can't seem to hit the ball and his team are counting on him. He doesn't know what the problem is, he comes to Swing Away to practice and have some privacy from the team and here meets the alluring Alyssa. Alyssa, who is a bit of a expert offers to help him with his troubles. As they slowly start to spend more time with each other, they become increasingly fond with one another. Although the relationship begins with rocky start thanks to Dylan and Lauren but its all in good in the end. I really loved how they are both willing to go to extreme lengths to help one another, Alyssa helps Tristan and Tristan helps Alyssa save Swing Away, but will they succeed? OMG! Kyle and Faith are really LOVED up in this book, I wanted more Kyle and Faith. I am hoping they end up married and have adorable babies. You can also see a big change in Kyle thanks to Faith and vice versa. I am beginning to love the authors writing, it makes me fall in love with the characters all over again. I love how everything seems to just flow and nothing is ever easy for the characters even when I wish they were. There are twists and turns and winning each other back. I love it when the guy has to work for winning his girl back it makes it so much joy reading it. Loved Kyle and Tristan *swoons*. Young adult age-range: 13+. Kissing. Mild Swearing. PG with 17 yo narrators. Swinging at Love was cute, heartwarming, a bit OTT at the ending, yet realistic the rest of the time. I thoroughly enjoyed it, and would recommend it in a heartbeat. I look forward to more in this series, and more by this author. Kendra C. Highley is becoming one of my favorite YA authors. I really enjoyed The Bad Boy Bargain (it's the kind of fluff readers are looking for when they are in a reading slump), so I was excited when this sequel was offered to me. Swinging at Love takes place in the same high school and even includes cameos from the lovebirds in book 1, Faith and Kyle. I really enjoyed The Bad Boy Bargain (it's the kind of fluff readers are looking for when they are in a reading slump), so I was excited when this sequel was offered to me. Swinging at Love takes place in the same high school and even includes cameos from the lovebirds in book 1, Faith and Kyle. But this time the story isn't just about ballet and landscaping. It's about love and baseball and the little bits in between. Alyssa is a strong-willed and confident dancer. She also happens to be a kickass softball player but maybe that's because she spends a lot of time working at Swing Away, the batting cages owned by her family. With extensive (and expensive) repairs that need to be done and the new sports complex in town stealing all of their business, Swing Away is at risk of closing forever. Needless to say, Alyssa is stressed out. How can she focus on her ballet audition when her family's beloved business is going under? Tristan is a batsman on the high school baseball team. He's suffering from a batting slump and striking out more often than he'd like to. To get away from the pressure of it all, he wants to practice somewhere outside of town where he's less likely to run into his teammates. Somewhere like Swing Away. Is he ever going to get out of his head long enough to get his swing back? I hate to say it, but it's like love at first sight between Alyssa and Tristan. It's kind of annoying but mostly cute, so I'm not complaining. Alyssa is just the person to help Tristan get out of his slump, but there's plenty of drama amongst their friends to create a little delay from the inevitable. Overall, this was a very fun and fast-paced read. I love reading about sports that I know nothing about. My baseball experience is limited to one Toronto Blue Jays game (which was fantastic) so I'm obviously not informed on all the ins and outs of the game, but I still loved reading about the practices and stuff. Athletes are like mysterious creatures to me. What makes them good at the game? Or bad? What drives them? In this case, romance is the catalyst for success. Ironically, I was in a reading slump before I read this book so it looks like romance was the cure for me as well. Pick this up if you're looking for a fun and flirty story! This is the second book in the Suttonville Sentinels however, you don't necessarily need to read book one in order to know what is going on in this book. Alyssa is a dancer, but once upon a time she played softball and she was really good at it. So it's no surprise that she loves working at Swing Away, the batt Thank you to Entangled Teen and Netgalley for a copy of the eARC in exchange for a fair review. Alyssa is a dancer, but once upon a time she played softball and she was really good at it. So it's no surprise that she loves working at Swing Away, the batting cages her family owns. However, things are going well and she is worried that her dad will have to close the business down. Tristan is a big hitter, but lately, he hasn't been hitting anything and he is worried that he is going into a slump at the worst time of the year. The playoffs so when he wants to hide it from the team and yet practice he heads over to Swing Away because no one goes there. While he is practicing Alyssa comes over and helps him out, but after they part neither one can stop thinking of each other. Alyssa thinks he is stressing himself out, and Tristan is intrigued by the girl who knows so much about baseball. Things run into a major problem when it is revealed that their best friends have a thing for them. Tristan's friend asks Alyssa out and Lauren tries to flirt with Tristan. Instead of coming clean about the start of their romance they try to hide it. Once Dylan catches them everything blows up in their faces. Will Alyssa be able to help her dad save the business? Can she help Tristan get out of his slump? This was every bit as good as the first one, I read it all in one sitting. Alyssa is a great character, she is practical, solid and the kind of person you want to know for real. Tristan is sweet, hot and a rocking book boyfriend. Together they were unstoppable and I was so glad how things worked in the end. A sweet, light, heart-warming story. Perfect for summer. More baseball players! That is precisely what passes through your mind when you finished reading Kyle and Faith's story. Hopping right into this book, you're hooked. There is absolutely no reason for anyone to not like this book. It's a quick, fun read. I love Tristan and Alyssa. The chemistry between them is just . . . Aaah! Love it! And I am big on sweet sports romance. I will read about any DISCLAIMER: I was sent an e-galley of this for my participation in a blog tour with Chapter by Chapter. More baseball players! That is precisely what passes through your mind when you finished reading Kyle and Faith's story. Hopping right into this book, you're hooked. There is absolutely no reason for anyone to not like this book. It's a quick, fun read. I love Tristan and Alyssa. The chemistry between them is just . . . Aaah! Love it! And I am big on sweet sports romance. I will read about any type of sports player, but baseball?! Baseball is my deal. Always has been. Mix a dancer into the mix. I don't know how to dance that well, so when a character dances in a book, I imagine it is me. I totally imagined that while reading. Kendra C. Highley is one of my top favorite authors. The first book I read from her was Finding Perfect, and that book is forever one of my top favorites. And then there was Defying Gravity that follow a supporting character from Finding Perfect and I knew I would love anything this author writes. And it is the completely truth. Loved The Bad Boy Bargain, and now I love this book. All we need now is for Kendra to write another surprise. Because I was totally surprised when this series appeared. This book is so fantastic! Loved reading it, these two were so great together! I can't wait for book 3! ARC provided by Netgalley in exchange for review. Basically I really liked this book. It's been a while since I sat down and read a teen romance but this one was pretty cute and about baseball, so really loved that. It was low on the angst and drama and just a lighthearted and hopeful read that had me smiling and thinking about those awkward and shy high school years.